The Oval diamond is often overlooked as a diamond choice, although the popularity of this cut is gaining momentum. There are a few different types of oval cut diamonds. The most common is the “Oval Brilliant”. This cut design shares many of the faceting characteristics of the Round Brilliant cut diamond, however as it is one of the “fancy Cut” diamond types, this shape cannot be graded for cut in the way round brilliant cuts are. No matter how good the cut of an oval diamond is, the certification will not give it a cut grade as this can only be given to the Round brilliant cut diamond. The Best Oval Cut Diamonds are the Oval Brilliant Cuts. The Oval brilliant cut diamond is in most cases a bigger diamond than many others, when we consider weight for weight options. Its length and width give it a greater surface area above the girdle. In diamond terminology we call this its “spread”. For example a princess cut diamond at 1.00ct is around 5.5 x 5.5 mm wide, if it is a good example of the cut. An Oval brilliant cut diamond of the same weight will be closer to 5.6 x 8 mm. This gives this diamond cut close to a 50% advantage in terms of spread in this case for its relative weight. Basically the cut proportions simply make it bigger than many of its counterparts. Oval cut diamonds look especially good on long slender fingers but conversely, if you feel you fingers are not so long (and wish they were), this diamond shape helps compliment the hand, giving a longer look down the finger. It is often said in retail stores that oval diamonds are more expensive that other cuts of diamond. 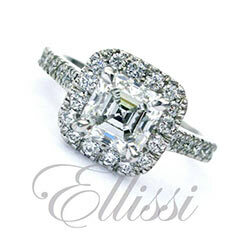 This can be the case in the larger sizes over 1.5 ct. In fact this is not the case in 1.00 ct sizes. Oval diamonds are a much better cost than say the round brilliant cut for example. There are far fewer of them around so the pool to draw from is reduced, however great value can be found in most grades. As with all diamonds, cut is very, very important. As these diamonds are not graded for “Cut” by any certifying lab, you need really sound advice from a professional to get this right. The cut should not be too deep, not too shallow, with just the right ratio to give it a nice shape. The oval cut is a great way to maximise a diamond’s weight. It is no coincidence that many of the largest diamonds the world has ever produced have been cut into Oval shapes…a classic cut that you really should consider as they are a great option both in terms of size and cost. A well cut oval will help to produce the perfect ring. Click on this link to view some of the stunning oval diamond rings we have made over the years.